My personal Aladdin Puzzle collection on my wall is covered in this category. 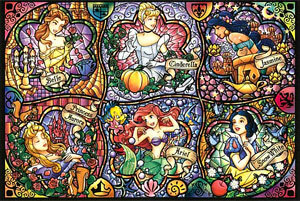 Check out this mouth watering Â puzzle of the ‘classic six’ Disney Princesses, Snow White, Cinderella, Aurora, Ariel, Belle and Jasmine. It’s made for the Japanese domestic market. I’ve seen Japanese DP merchandise before and must say they often make really nice high quality artwork,Â originalÂ stuff there. Unlike the American and European market where we get always the sameÂ merchandiseÂ with the same old artwork time and time again. The header image above of Aladdin and Jasmine horseback riding to the sunset is the latest addition to my Aladdin Puzzle Collection. The puzzle counts 30 large pieces good for a couple of minutes fun while assembling. It’s made by the unknown France manufacture Carrefour and includes a poster. The header is actually made from said poster because lots of folds I couldn’t correct them enough to make a decent wallpaper. I wasn’t happy how The Seven Faces of Genie header anyway. Browsing EBay for unique interesting products I found a never before seen WHOLE NEW WORLD FABRIC ART PANEL to make a pillow purse or decorative panel from. An UK seller listed a placemat showing Al on Carpet avoiding Rasoul and his men’s swords. Last year I spotted a placemat with Carpet on it. A cute Prince Ali puzzle fabricated by MB by a German seller. I hate that there’s no more room for these decal stickers of Jafar and Jasmine on my bedroom walls. They’re packed with puzzles, posters and litho though if I can moved them closer together I might be able to stick in a few more small decorations. Those 500 piece puzzle of the theaterical posters from Aladdin, Beauty and the Beast and Snow White and the Seven Dwarfs I mentioned the other day where delivered yesterday. The y looked lovely from the box. Though it wasn’t in a great condition I was ready for the challenge in completing 3 x 500 piece puzzles. The only other 500 p. puzzle is a cute princess one. The glue mentioned on the box was not included, 30 pieces from Beauty where broken. (image had fallen from the carbon), Snow White had the same problem but with fewer broken pieces. A counting revealed that Beauty and Aladdin might be missing pieces. A recounting seemed to confirm that. Although I was not pleased I hoped that at at least Aladdin was complete so I only had to get a refund for the other two. You can imagine my dissapointed that upon completing 99.9% (with great help from mom, thanks!) the puzzle missed 3 pieces. So I requested a refund and will ship the boxes back to England tomorrow. Slowly, puzzle by puzzle is my room transforms into an Aladdin shrine. Four more where put up today.